You’ve read all the online advice on how to get a good night’s sleep. Don’t watch TV, work on the computer or check your phone before bed. Eat supper at least three hours before sleep. Make sure your room is dark, quiet and cool. You do all of this yet you still feel tired during the day. The problem may not be what you’re doing but rather a medical condition called sleep apnea, which temporarily pauses breathing while you sleep. Fortunately, there is treatment. If you are diagnosed with sleep apnea in Jacksonville or Orange Park, FL, Drs. Jignesh can prescribe a special oral appliance to help you breath so you once again get a restful night of sleep. The most common form of this condition is called obstructive sleep apnea. When you’re asleep, your tongue and the soft tissue in your throat relax just like the rest of your body. In this relaxed state, this tissue may collapse and consequently obstruct your airway. As you breathe, air vibrates this tissue and your bed partner likely hears the telltale sign of sleep apnea—loud snoring. Everyone snores sometime, such as when you have a cold or allergies. But when snoring is caused by a blocked airway, the problem is more serious. Furthermore, sleep apnea can aggravate or may even lead to several systemic illnesses. Researchers have found a connection between sleep apnea and high blood pressure, cardiovascular disease, stroke, depression and diabetes. The Dental Center of Jacksonville has a sister location in Orange Park, FL called Kind Care Dentistry. Here, Drs. Patel also diagnose and treat sleep apnea. For years the gold standard for treatment was a CPAP machine. Now, however, there is treatment that is far quieter and more comfortable. 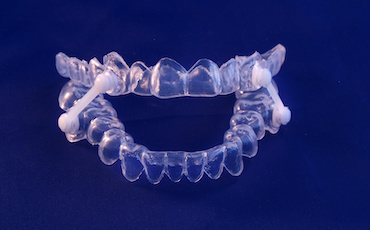 We can prescribe a made-to-measure oral appliance that is worn nightly. Made of smooth plastic, the appliance gently shifts your lower jaw forward in order to prevent your tongue and the other soft tissue from obstructing your airway. In addition to wearing an oral appliance, there are lifestyle changes you can make that may help with the symptoms of sleep apnea. First, watch your weight. Extra weight, especially around your jaw and neck, can put pressure on your airway. Secondly, avoid alcohol or medications that relax the central nervous system. This may lead to central sleep apnea, which is neurologically based. Finally—and this almost doesn’t need mentioning—quit smoking. Kicking the habit makes breathing easier and gives your lungs and circulatory system a healthy boost.